Unlock the Sinister Secrets of Freeport! From the moment of Freeport's inception, the subversive cults of terrible and fearsome gods have plotted and connived to find a way to bend the city toward their own sinister goals. From the dreaded Brotherhood of the Yellow Sign to the alien priests of the snake-god Yig, it seems Freeport is infested with these strange and unsettling groups. Whether allied to some dreaded demon prince or serving a bloody ghost who demands his children kill for the love of killing, the cults of Freeport are a constant and dangerous threat, forces of such evil they nearly defy description. Most Freeporters may wonder what villainy is afoot, but many have learned to not look too closely, for sometimes it's better not to know what malfeasance brews in their neighbor's home ... or beneath their very feet. The Brotherhood of the Yellow Sign: A foul group of madmen devoted to the horrific Unspeakable One. The Priesthood of Yig: The ancient religion of the lost Valossan Empire that seeks to find its place in a world dominated by lesser races. The Lost Souls of Yarash: Bloodthirsty pirates that butcher innocents to glorify their bloody-handed god. The Esoteric Order of Starry Wisdom: A hidden cabal of wizards behind Freeport's Wizards' Guild who search for the power contained within the elusive Azoth Stone. Scions of the Destroyer: A filthy cult of demon-worshippers, they strive to release Abaddon from the Bottomless Pit and usher in the final age of the world. The Charnel Children: A ghoulish pack of cannibal children led by a muttering lunatic devoted to the bestial Charnel God. The Society of the Velvet Whip: Deviants dedicated to the exploration of pleasure and pain, they infest Freeport and erode its morality with their excess. The Obsidian Brotherhood: A strange cell of killers and scholars united in their thirst for the knowledge contained within the fragments of a being known only as the Wanderer. 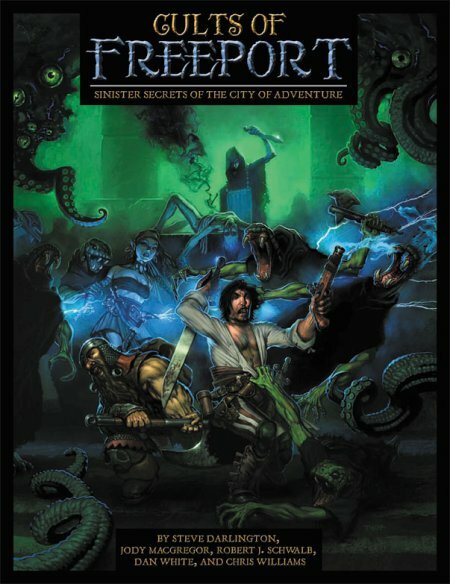 Cults of Freeport follows the pattern established in The Pirate's Guide to Freeport in that it dispenses with game statistics to ensure this sourcebook useful no matter what campaign setting you use or game system you play. The Brotherhood of the Yellow Sign was just the beginning. Learn the unspeakable truth about Freeport's corruption in Cults of Freeport!